“The approach is the right one,” says Chancellor Angela Merkel. 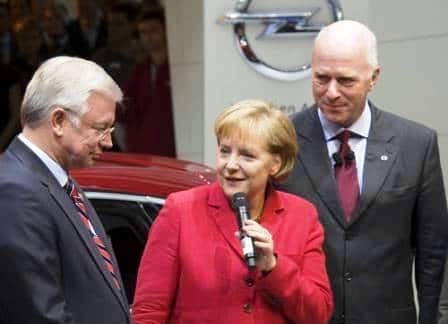 German Chancellor Angela Merkel, center, with several former Opel executives. 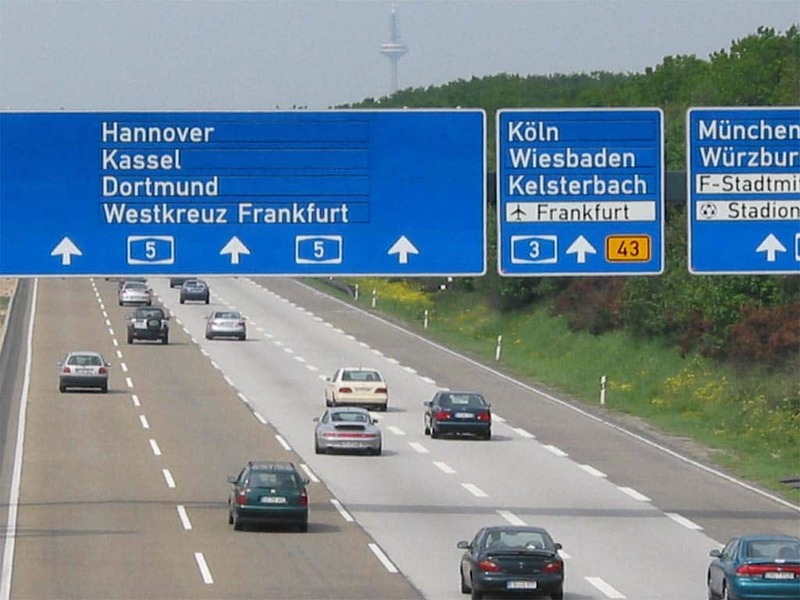 It’s the home of the Autobahn, super-smooth highways where German motorists can generally drive as fast as their gas and diesel-powered cars will allow. But Chancellor Angela Merkel signaled that Germany’s drivers may soon have to switch to battery-electric and other zero-emissions vehicles. In an interview with the country’s Super Illu weekly, Merkel expressed support for new plans to phase out the internal combustion engine in countries including Norway and the United Kingdom. Whether Merkel is seriously committed to enacting a ban on internal combustion vehicles in Germany is uncertain, though the concept has been floated by other politicians in recent months. The Chancellor is in the midst of a tough reelection battle, Merkel hoping to win a fourth term next month, and she is clearly hoping to win support from backers of Germany’s strong Green party. But her comments on a possible ban of the internal combustion engine come barely a week after a German summit in which automakers attempted to lay out a case for continuing support of diesel power. So-called oil-burners have accounted for roughly half of the European market over the last decade, significantly higher mileage and often-subsidized fuel costs offsetting higher vehicle prices. Nothing symbolizes the prowess of the German auto industry - or the power of its cars - like the Autobahn, must of it with no speed limit. But diesel’s reputation has been sorely tarnished by the revelation that Volkswagen rigged at least 11 million vehicles to illegally pass emissions tests – more than 500,000 of those sold by its various brands in the U.S. In recent months, a number of other manufacturers, including industry luxury leader Daimler AG, have faced similar accusations, and millions of European diesel vehicles are facing recall to update their emissions control systems. In the Super Illu interview, Merkel repeated her prior criticism of Volkswagen, the automaker facing tough sanctions and almost $30 billion in expenses related to the scandal so far. German prosecutors in several regions are conducting ongoing investigations that have already led to charges against an Audi manager. Several senior VW officials may yet face charges, as well, according to recent German media reports. 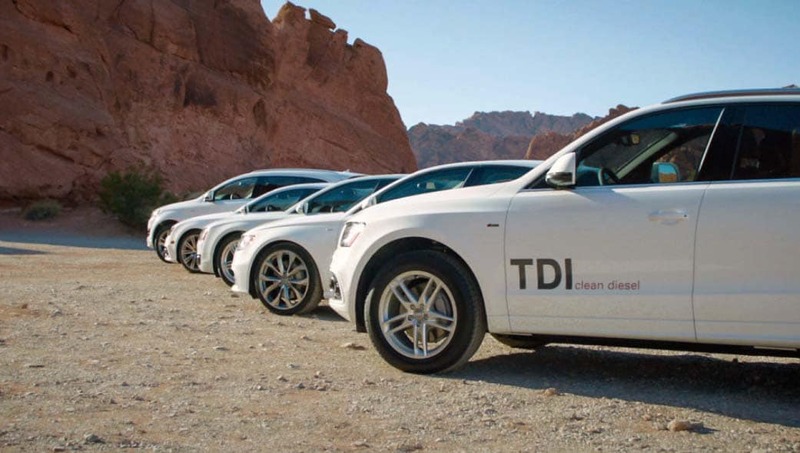 A number of cities are now considering near-term diesel bans, including not only Paris but Munich, home of BMW, the world’s second-largest luxury auto manufacturer. The VW scandal has emboldened not just diesel critics but those who would like to ban all forms of internal combustion vehicles, however. Just late last month, officials from Prime Minister Theresa May’s government said the United Kingdom will halt sales of all new vehicles with diesel and gasoline engines by 2040 as a way to fight pollution. France is considering a similar ban Environmental Minister Nicolas Hulot in early July declaring it “a very difficult objective,” but insisting, “the solutions are there,” ahead of the opening of the G20 conference in Hamburg, Germany. 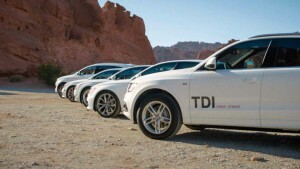 VW and its various brands have encouraged opponents to call for bans on diesel cars. A small but growing number of other countries have either already laid out plans for a ban or are working on possible legislation. Norway, where one in three vehicles now being registered uses either a plug-in hybrid or pure battery-electric powertrain, will go fully electric in 2025. And heavily polluted India not only wants to ban the sale of gas and diesel vehicles by 2030, but it wants to then replace all older vehicles powered by internal combustion. And China is also taking steps to ramp up sales of electrified vehicles, though it has not yet called for a full IC engine ban. In some ways, a ban in Germany would be a symbolic tipping point. The country is not only one of the world’s largest producers of motor vehicles – and the largest source of luxury cars and light trucks – but its Autobahns have been symbols of the power and speed normally associated with modern internal combustion engines. Yet, even while the country’s manufacturers were hoping to find ways to keep diesels alive with last week’s summit meeting, they have all begun a rapid push into electrification. Mercedes will introduce a new battery sub-brand and launch it with a version of the Mercedes-EQ Concept. Volkswagen, for one, plans to have at least 20 fully electric vehicles in production by 2025. It is getting ready to launch its first long-range affordable model, the I.D., next year. Its Porsche and Audi brands are also readying costlier, high-performance models. Both BMW and Daimler are following similar paths. BMW already operates a sub-brand, BMW i, which focuses solely on electrified products. 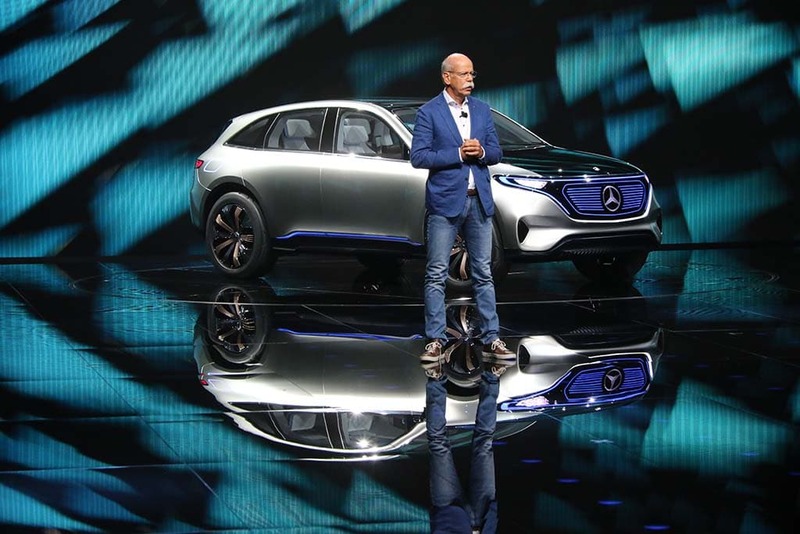 Daimler is launching a similar unit, Mercedes-EQ, that is working up at least seven pure battery-electric models, including one based on the EQ concept car unveiled at the 2016 Paris Motor Show. German leaders are encouraging the industry to look at other zero-emissions options, as well, notably fuel-cell vehicles. And the country is backing that by launching an initiative that will create a nationwide network of battery chargers and hydrogen pumps all along those Autobahns over the coming decade. This entry was posted on Tuesday, August 15th, 2017 at and is filed under Automobiles. You can follow any responses to this entry through the RSS 2.0 feed. Both comments and pings are currently closed.